Tangier has long been romanticized by artists, Beat poets, and writers who have arrived at its busy shores seeking adventure. Tangier is the gateway to Africa for many travelers. Cruise ships often dock there on their way from the Atlantic to the Mediterranean, and travelers in Europe find it easy to take a quick ferry from Spain to the port of Tangier. Although most visitors to Tangier come for a day, there are some lovely boutique hotels to stay at, and once you figure out how to avoid some of the hustle, you'll appreciate Tangier a lot more by spending a few days here. Tangier doesn't have quite the offbeat charm it did in the 1940s and 1950s when you could rub shoulders with the likes of Truman Capote, Paul Bowles, and Tennessee Williams. But if you give it some time, and ignore the tourist touts, it will grow on you. Tangier is an interesting, cosmopolitan mix of African and European influences. As with many cities in Morocco, there's an old town (Medina) and a new town (Ville Nouvelle). The Medina: Tangier's Medina (old walled city) is a lively place, its alleyways are filled with shops, teahouses, and brothels (it's a port city after all). Tourist trinkets are plentiful here, if this is your only stop in Morocco, buy away. But if you plan to continue traveling in Morocco, you'll find better deals elsewhere. The Kasbah: The Kasbah is located high on a hill in Tangier with some good views of the ocean. The old Sultan's palace (built in the 17th century) lies within the Kasbah's walls. It is known as Dar El Makhzen and is now a museum that houses fine examples of Moroccan art. Beaches: The beaches closest to town are rather dirty, as is the water. Find better beaches about 10 km west, out of town. 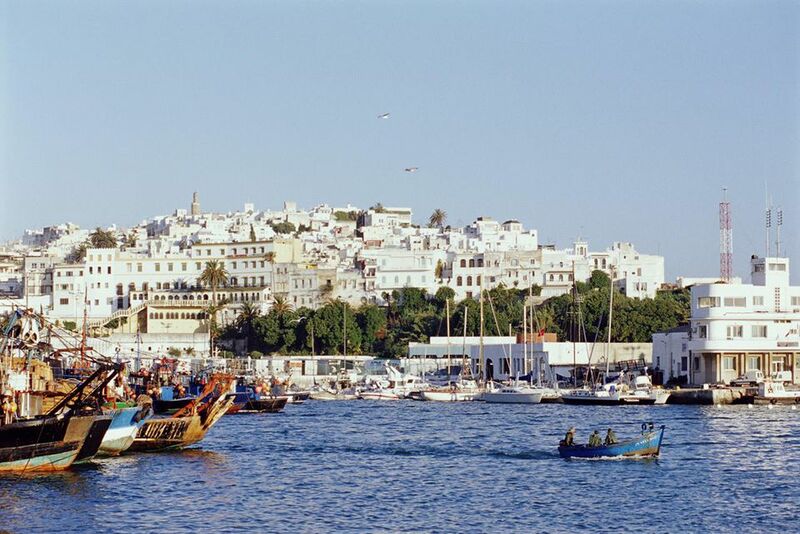 Tangier is just a short boat ride from Spain and the gateway to the rest of Morocco whether you travel by bus or train. High-speed ferries can take just 30 (choppy) minutes to cross. Tarifa (Spain) to Tangier (Morocco): High-speed ferries leave every two hours from Spain's windsurfing capital, Tarifa, and take 35 minutes to get to Tangier. FRS offers good service on this route, a round-trip adult ticket sets you back around 37 Euros. Barcelona (Spain) to Tangier (Morocco): This is not a popular route, but handy if you want to avoid traveling down to the south of Spain. Grand Navi is the company that operates these ferries. A roundtrip ticket for a single foot passenger in a seat (rather than a berth) costs around 180 Euros. Ferries take 24 hours to get to Morocco and 27 hours on the return trip. There's usually just one ferry scheduled per day. If you are planning to take a train to visit Fes or Marrakech, then arriving in Tangier is your best option for rail connections to these destinations. The Tangier train station (Tanger Ville) is about 4 km southeast of the ferry port and bus station. Take a petit taxi, make sure the meter is on, to get to and from the train station. Tangier has a wide range of affordable accommodations, mainly excellent riads (boutique hotels in restored mansions). Finding a good hotel that offers a little respite from the hustle will really make your visit more enjoyable. Make sure you book your first night in advance and don't listen to people on the street who offer to show you to a hotel. La Tangerina: A lovingly restored boutique hotel, with 10 unique rooms. Its location is in the Kasbah, one of the most upmarket sections of Tangier, situated on a hill overlooking the rest of the city. Enjoy meals on the rooftop terrace, with traditional Moroccan cuisine available for dinner. Rates start at 45 Euros per night. Dar Jameel: If you want to stay in the heart of the medina, Dar Jameel is an excellent choice. This boutique hotel offers eight sprawling suites around a central interior courtyard, on five levels. Each room is beautifully decorated with traditional Moroccan furniture and crafts. Breakfast is included in the rate. Room rates start at 48 Euros per night. Dar Nour: Small, boutique hotel located in the Kasbah, convenient to all the major sights. The rooftop terrace is gorgeous, overlooking the town and the ocean in the distance. There are seven rooms to choose from, stylishly decorated with authentic Moroccan tile, carpets. and furniture. Rates start at 63 Euros per night, including breakfast. Dar Nilam: Upscale boutique hotel in Tangier offering personalized service, opulent decor, and pick up from the ferry (a nice touch). The hotel has five rooms, a small garden, and a pool. Dinner is traditional Moroccan fare, breakfast is included in the room rate. The hotel is located a mile from the town center and is close to the beach. Rates start at 80 Euros per night. The best time to visit Tangier is from September to November and March to May. The weather is perfect, not too hot, and the tourist season is not yet in full swing. You also have a better chance at finding a room at a nice riad for a good price. The best way to get around Tangier is either on foot or in a petit taxi. Make sure the driver uses the meter correctly. Grand taxis are much more expensive and you have to negotiate the rate in advance. Of course, you can always get a personal guide through your hotel or book a day tour before you get to Tangier. Tangier is infamous among visitors for its persistent touts (hustlers). A tout is a person who tries to sell you something (a good or a service) in an importuned manner. The minute you get off your ferry or train, you are likely to meet your first tout. Follow the advice below and you will have a much better time in Tangier. While hospitable and friendly folk abound in Tangier, be careful when you're in a touristy area and you're offered something for free. It is rarely free. Advice on where to buy your train ticket or ferry ticket will be offered by many folks, but just be aware these guys work on commission. You can easily buy your own ticket and fill out your own forms. Be firm and say "no thanks" and look confident. If you really don't know where to go, then be aware you will end up paying a tip for getting help with directions, no matter how many times the offer is given for free. A "free" guided tour around the Medina will most likely lead to an uncle's trinket shop or a demand for money at the end of the tour. It may also include shops you are not remotely interested in seeing. A free cup of tea might include looking at a lot of carpets. If you hear the word free, the price you pay is often not in your control. But remember your faux guides are simply people trying to make a living to support their families. While ripping off gullible tourists may not seem like the most honest way to make money, it's simply a survival tactic and you shouldn't take it too personally. This tip is especially useful for the independent travelers. When you arrive in Tangier, either at the bus station, train station, or ferry port you will be greeted by many people, inquiring rather loudly, where you want to go to. Many of these folks will earn a commission for taking you to a hotel of their choosing. This doesn't mean that the hotel will necessarily be bad, it just means you may end up in an area you don't want to be in; the price of your room will be higher to cover the commission or the hotel could be questionable. Don't believe the hype. Make a reservation with a hotel before you arrive, especially if you're arriving in the evening. Your guidebook will have phone numbers of all the hotels they list, or you can research online before you go. Take a taxi and insist they take you to the hotel of your choosing. If your taxi driver pretends not to know the location of your hotel, take another taxi. Most respectable hotels can also arrange a driver for you, which takes away some of the stress. It's better to pay a little more for your first night in Tangier rather than to end up somewhere you don't want to be. If you wish to avoid a lot of unwanted attention, the best thing to do is take a guided tour of Tangier. You will probably still end up in shops you don't really wish to see and you won't go off the beaten track, but if this is your first time in Africa, it may be more enjoyable. Most hotels will arrange a tour for you as well as tours to nearby attractions and towns outside of Tangier. There are lots of tour agencies near the ferry ports in Spain and Gibraltar that have scheduled day trips on offer. You will be with a group on these tours and that has some advantages and disadvantages. Regardless, checking out tour itineraries will help you figure out what to see in Tangier. Long pants or long skirts/dresses are recommended. Women will get a lot of unwanted attention by strolling around Tangier in shorts or a short skirt. Wear T-shirts with 3/4 length sleeves, and always bring a shawl to wrap around your shoulders, especially when entering a religious or formal site.